In a classy gym in Amman, Jordan’s capital, 23-year-old university student Dana Soumbouloglou pours with sweat as she lifts weights. She is trying to make her way as a bodybuilder in a society that bars women from the sport for cultural and religious reasons. Soumbouloglou used to love to watch the Ms. Olympia competition when she was a little girl and hoped she could compete in it one day. She started practising the sport in 2012, striving for excellence. Her path has not been smooth: friends and relatives, including her mother, criticised her and told her she would lose her femininity. Men in the mixed gym she works out in also told her that bodybuilding was a sport for men only. Her dream is to travel to America to compete for the title of Ms. Olympia. "I smile when I hear criticism and I try to explain that girls can succeed in this field [just like men] - some are convinced, while others are not," she said. Natalie, Soumbouloglou’s younger sister, supports her passion. According to Natalie, weight-lifting gave Dana more confidence and even changed the way she thinks. “Her thoughts and ideas have become more positive and creative, and her character is more charismatic now,” she said. Soumbouloglou works as a fitness trainer. Soumbouloglou practises daily. “Exercise is a part of my everyday routine. I go to the gym six days a week, and spend an hour and a half weight-lifting." She follows a special dietary regime that includes carbohydrates, proteins and nutrients, in five daily meals. Sculpting an impressive physique is not her only goal. She wants to break other taboos, such as participating in local and international competitions. Sombouloglou aims ultimately to take part in Ms. Olympia in the US. Her idol, Brazilian champion Juliana Malacarne, won one of the categories in 2014. 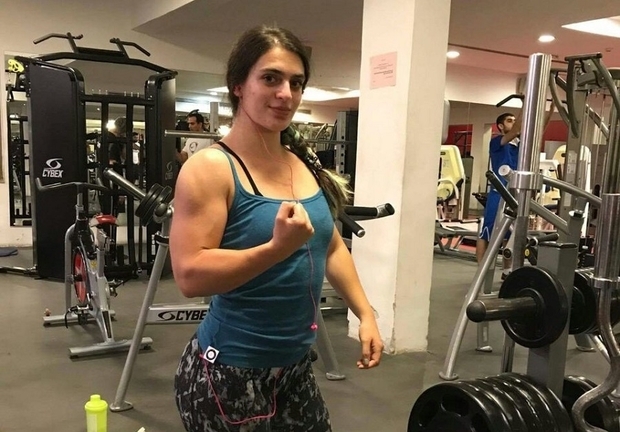 She wants to be the next Malacarne, except there are no bodybuilding tournaments for women in Jordan. 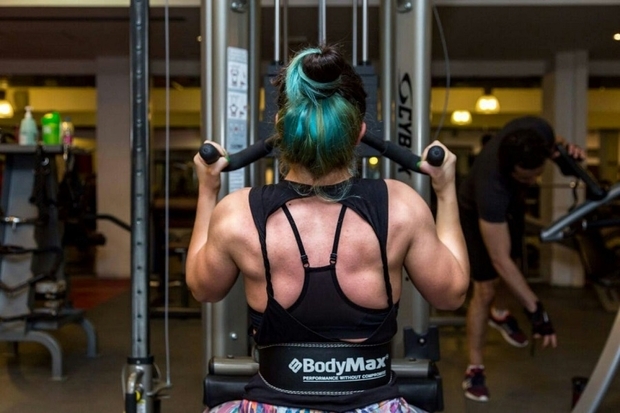 “No women [professionally] practise this sport in Jordan,” said Fayez Abu Areeda, head of the Bodybuilding and Fitness Committee, affiliated with the Jordan Olympic Committee (JOC). “There is no legislation banning women but Jordanians do not approve of women taking part in these kinds of sports," he said. "Our society will never accept a woman displaying her muscles in public." He added that he would not approve an application submitted by a woman. “We do not have bodybuilding tournaments for females in Jordan, so there would be no one to compete with," he added. Not all Arab countries have strict views about women competing in weight-lifting competitions and representing their country. In 2016, Egyptian athlete Sara Ahmed was the first woman from an Arab country to win an Olympic medal in weight-lifting. Soumbouloglou works as a fitness trainer, and her clients include a number of young women who like working out but are not interested in bodybuilding because of the cultural prejudice. She also trains daily with national bodybuilding champion Nadeem Faran. Faran hopes that more young women will become interested in the sport and the Jordanian Olympic Committee would have a change of heart and allow women to participate. She goes to the gym six days a week, and spends an hour and a half weight-lifting. Farah Malhass, a 29-year-old who participated in an international competition for amateurs in Canada in 2010, faced similar obstacles, so she decided to move to the US, following the 2010 competition. In 2015, another Jordanian woman took part in an international competition, held in Dubai, alongside Bahraini bodybuilder Haifa Musawi. Hala Ahed, an activist at the Jordanian Women's Union, told MEE that society views women according to certain criteria and traditional social roles. "There are strict views about women's work and conduct. Motherhood is seen as a key role, which limits participation in other activities. Women exist primarily to breed and they are viewed as having weaker bodies." According to the World Bank, Jordanian women represented only 17.5 percent of the workforce in 2016. 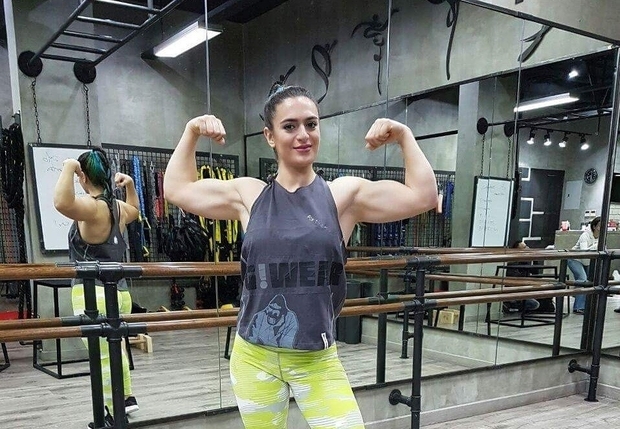 Should more women decide to follow Soumbouloglou's lead and take up bodybuilding in Jordan, it will present a major challenge to societal norms. It will perhaps also provide an opportunity for women to break out of the chains of proscribed roles. "Bodybuilding for women challenges the traditional notion concerning women being soft and in need of a man’s protection," Ahed said.